Worms are somewhat easy to spot. You may see the worm segments in the droppings, or in the finch's mouth. There are many types of worms your finch can pick up. They are: Tape worm, gizzard worm, caecal worm, round worm, thread worm and gape worm. None are pleasant and all can lead to the death of your finch. The most common of these is the tape worm. Worms are pick up from eating other animal's droppings, through eating live insects, or are passed from parent to young when the young are fed. This is why you should never feed your finches any insect you pick up in your yard. Always buy bug meal from commercial suppliers. These parasites live by taking nutrition from your finch. 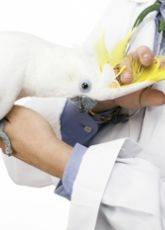 This results in a sickly, weak finch that could die from the infestation. The finch may display the sick finch appearance but the real clue to the worm infestation is weight loss. As the finch eats and eat to get enough nutrition to survive the worms take more and more. 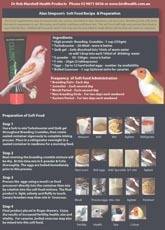 This leaves your finches weak, hungry, and thinning quickly. The most effective treatment for all of the above mentioned worms is Worm Away. The unique gel is water dispersible, may be applied over soft food, or can be given directly by crop needle. 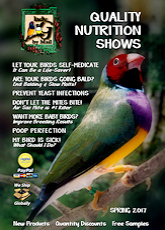 Finches that live in an indoor aviary have little chance of picking up any worms from their environment unless you bring them in with infected live foods. Always talk to your bug meal provider to learn if they test for tape worms. If all else fails, only buy human grade bugs. They require a much more extensive screening process. 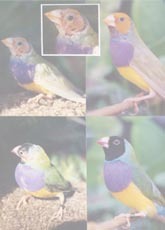 Finches that live in an outdoor aviary can pick up the worms from any small insect that may wander into the aviary. It's often wise to treat your flock for worms a few times a year to keep them as healthy as possible.